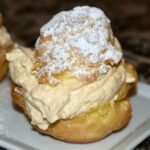 Have you made my Mom’s famous cream puffs yet? NO? What are you waiting for! 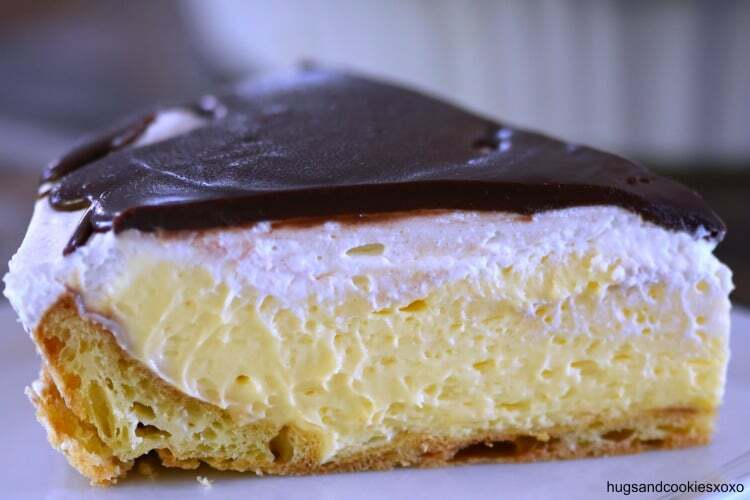 hahaha This recipe is a cream puff in pie form. That means more cream for you! 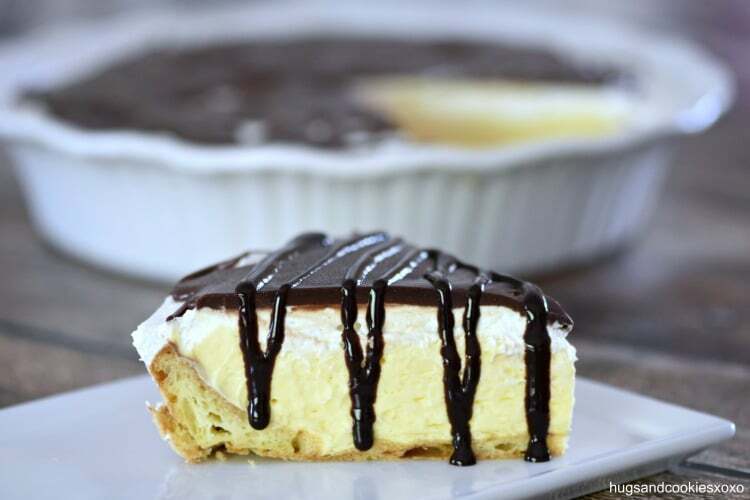 Definitely serve up this cream puff pie at your next gathering! I also drizzle on some chooclate syrup at the end but that is totally optional! Butter 9 inch pie dish. In a saucepan over medium bring water, butter and salt to a boil. On low, add flour stirring constantly. Once it pulls away from sides, add one egg at a time and mix well. Press in pan and halfway up sides. Bake in preheated oven for 30- 35 minutes until golden brown. In a pot over medium, combine chocolate and ½ cup heavy cream just till melted and smooth. In a mixer beat milk, cream and pudding mix until thick. Whip cream to soft peaks and add sugar-beat to combine. Spread over pastry cream and chill. Once cold, drizzle on the cooled chocolate and store in fridge. In a large mixing bowl, using an electric hand mixer, whip ¾ cup heavy cream until soft peaks form. Add in granulated sugar and whip until stiff peaks form. 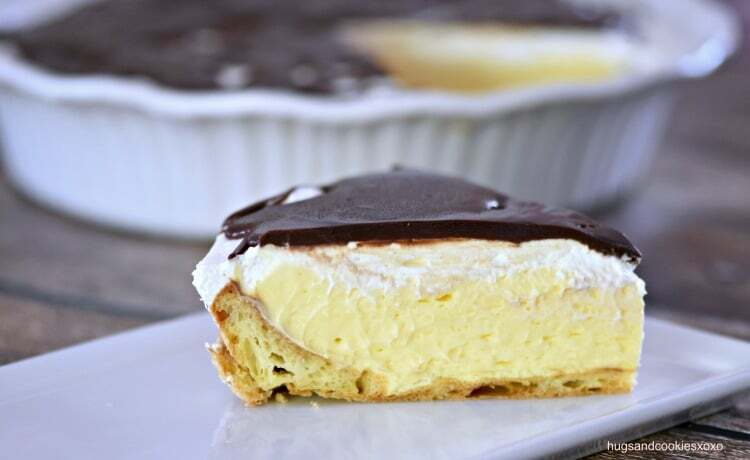 Spread sweetened whipped cream evenly over pastry cream layer. 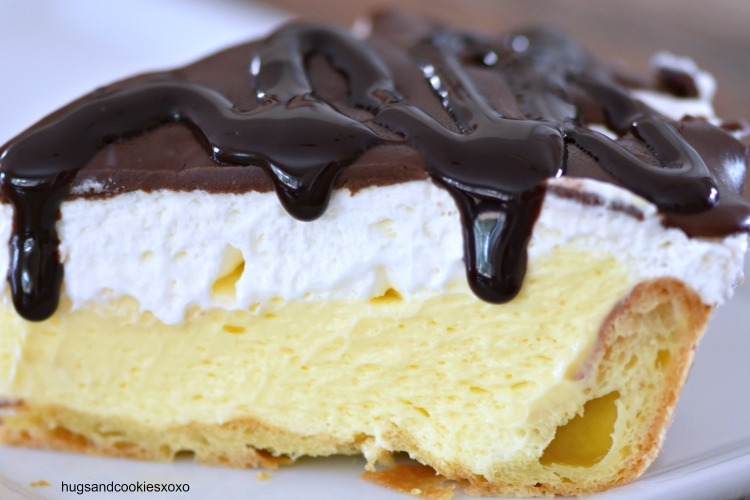 Cut pie into slices and drizzle each slice with cooled chocolate sauce. Serve immediately. Note: this pie is best served the day prepared. Also note, the sweetened whipped cream will begin to separate after about 3 hours so plan accordingly. Store in refrigerator in an airtight container. 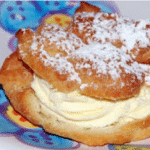 It has been a long time since I made a choux pastry. Is the mixture removed from the heat before adding eggs or are they added off the heat. How ingenius! 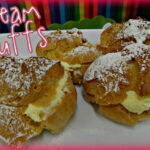 I love this version even better than regular cream puffs! Absolutely wonderful! Thanks so much for sharing.